The Sandpiper Studio opened in 2007 and we are pleased to have had many renowned artists from the UK and abroad sharing their tips and techniques with our students. These visiting artists are specialists in their field and provide an exciting range of workshops and demonstrations to instruct and inspire. They are usually held on Fridays and Saturdays and cover specific subjects and mediums. The workshops are suitable for all abilities unless otherwise stated, with the emphasis on having fun while learning. A selection of teas, coffee and biscuits are included along with a buffet lunch during a full day workshop. The studio can accommodate up to 14 students with a desk each in a workshop and approximately 30 students when watching a demonstration. For students travelling long distances and in need of local accommodation, a wide range of hotels, guest houses and travel lodges can be found within a few minutes drive from the studio. Contact Julie for more information. Please fill out the enquiry form on your chosen workshop to contact Julie for availability and payment. A £20 deposit is required for each workshop and the full payment is required for a demonstration when booking. We accept cash, cheque or bank transfer as payment, more details and important information can be found at the end of the programme. This workshop will give you an insight into how versatile acrylic paint can be. 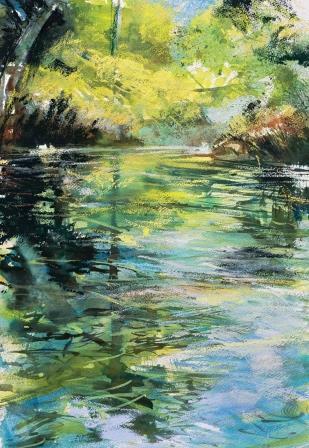 You will learn how to combine acrylic inks and acrylic paint in multiple layers to create a painting of 'River and Reflections' using expressive colours and mark making techniques. 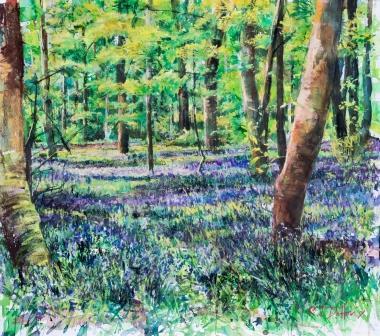 Robert's second workshop this weekend will once again explore how versatile acrylic paint can be. You will learn how to combine acrylic inks and acrylic paint in multiple layers to create a painting of woodland trees using expressive colours and mark making techniques. You can choose any season as the subject matter of your painting. 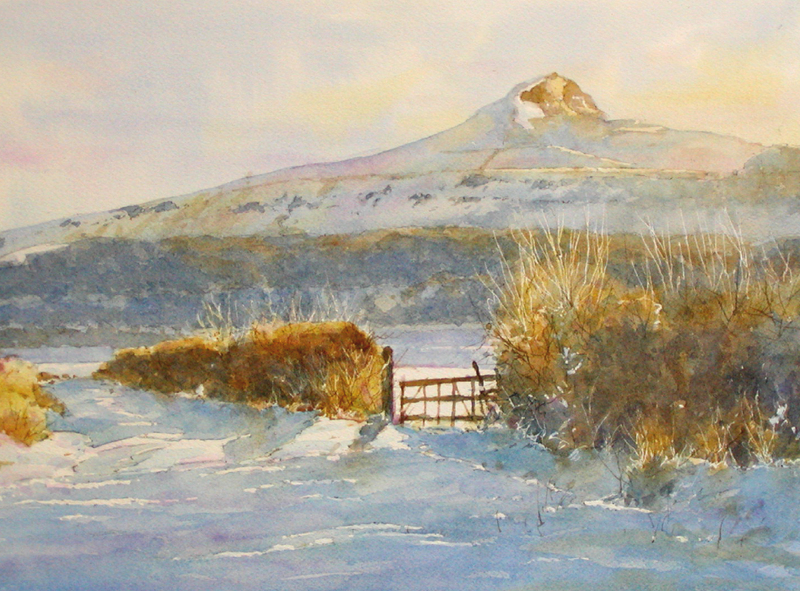 Robert will start the workshop with a demonstration of a snow scene in watercolour, he will then help students with composition, colour mixing and painting techniques when creating their own pictures. Robert always has plenty of reference material or students can bring their own. Robert is quite happy for students to use a different medium other than watercolour. 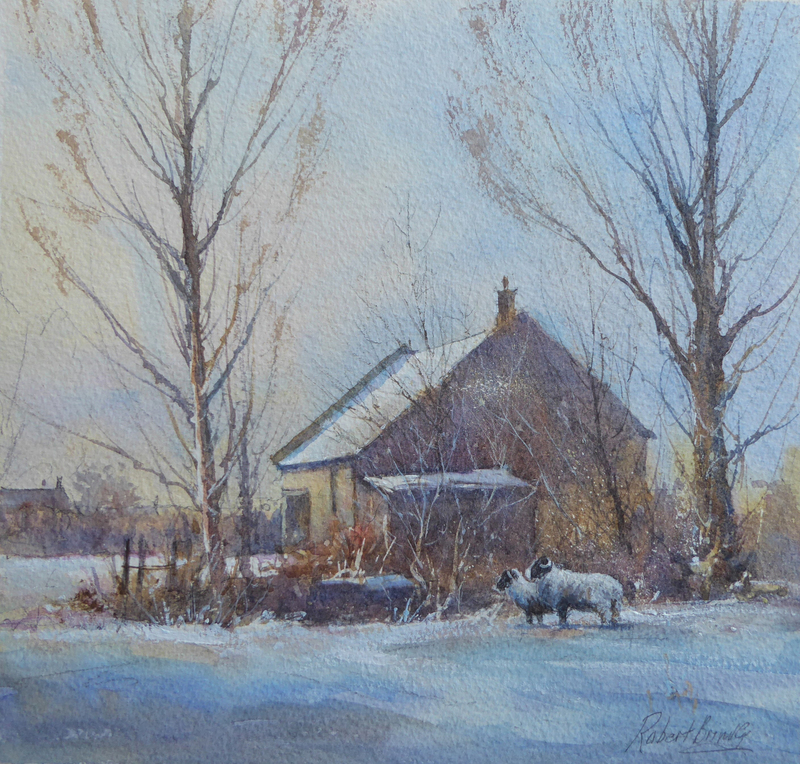 Continuing the theme of snow for this weekend of workshops, Robert will demonstrate another snow scene then help students create a picture of their own. He will give plenty of one-to-one tuition on composition, colour mixing and painting techniques. Robert always has plenty of reference photographs or students can bring their own. 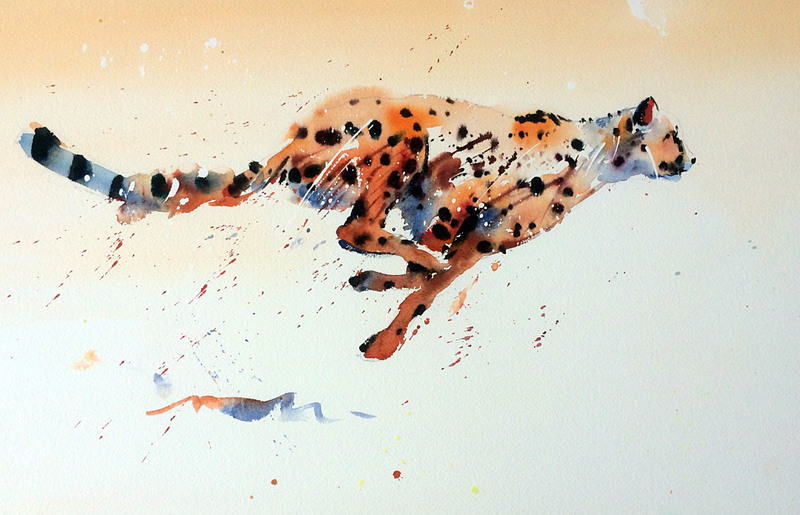 Using vibrant colour and expressive brush strokes, Jake will help you paint simple, bold, exciting animal portraits in watercolour. He will start with exercises and plenty of demonstrations before helping students create their own image of a 'Graceful Cheetah.' Jake will provide all photo references. 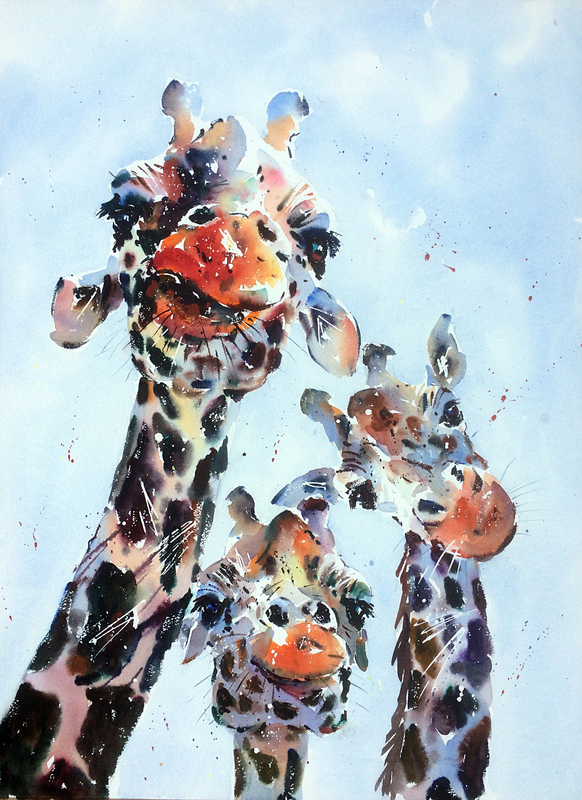 Using vibrant colour and expressive brush strokes, Jake will help you paint simple, bold, exciting animal portraits in watercolour. He will start with exercises and plenty of demonstrations before helping students create their own portrait of giraffes. Jake will provide all photo references. Kitty is one of the most talented and popular painters in Holland, her work has taken her all over the world and can be found in many private collections. 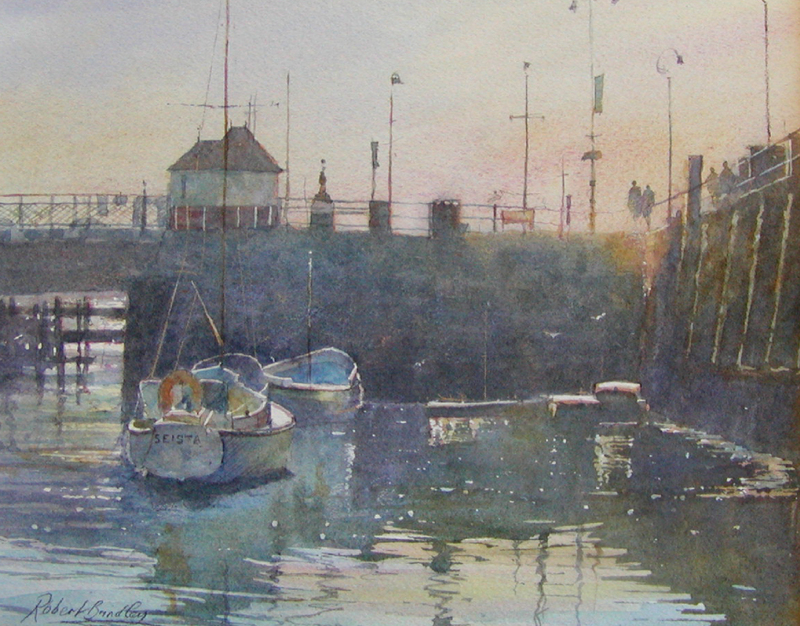 We are pleased to welcome her back to the UK for a weekend of watercolour workshops at The Sandpiper Studio. 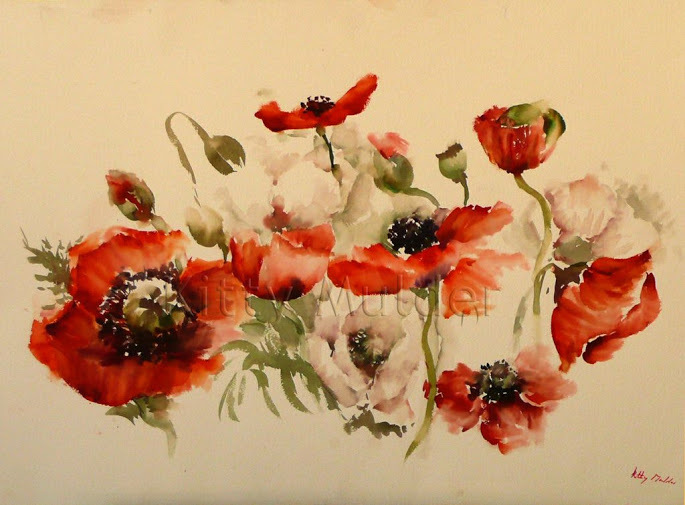 She will demonstrate her unique style of painting with brush and cotton wool to achieve loose, soft focus images of watercolour flowers. Kitty uses fresh flowers, silk flowers and photographs as reference material which will be available to students. Students can also bring their own flowers to paint from and a vase would be helpful. Kitty is one of the most talented and popular painters in Holland, her work has taken her all over the world and can be found in many private collections. In this second workshop with Kitty, students will learn how to paint loose, soft focus images of watercolour flowers using brush and cotton wool. Each demonstration that Kitty does is unique so that students who attend both days will not be repeating an exercise. Kitty will give plenty of group and one-to-one tuition. She will be using fresh flowers, silk flowers and photographs as reference which will also be available to students. Students can also bring their own flowers to paint from and a vase would be helpful. Valerie Briggs is an award winning wildlife artist and popular tutor, providing excellent tuition alongside a thorough knowledge of her subject. In this 2 day workshop students will learn how to use layers of watercolour to create the iridescence of Peacock feathers and head portrait. Val will provide some photographs and worksheets but students can also use their own reference material. Robert Brindley is a regular visitor to The Sandpiper Studio and a very popular artist and tutor whose workshops fill very quickly. 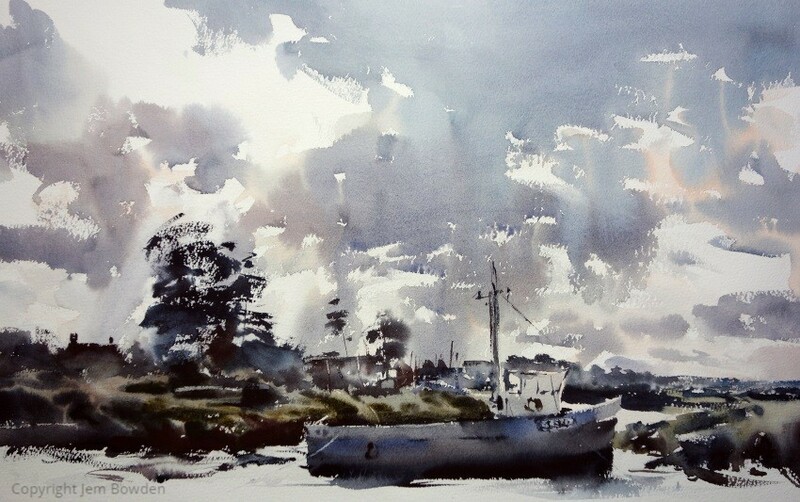 He will begin the workshop with a demonstration of a coastal scene in watercolour, he will then help students create their own paintings with hints and tips on composition, colour mixing and painting techniques. There will be plenty of one-to-one tuition and students can work at their own pace. Robert always has plenty of reference photographs or students can bring their own. He is quite happy for students to use a different medium other than watercolour. 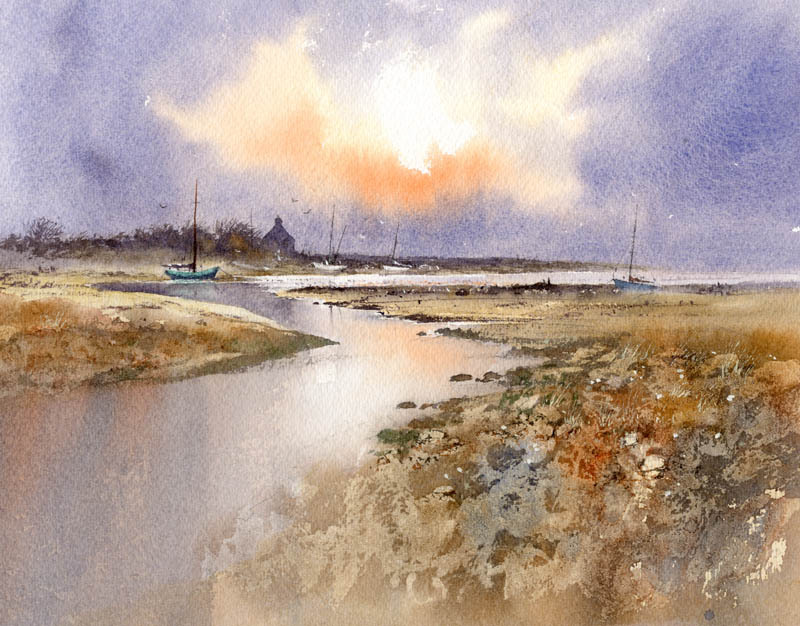 Robert will begin the workshop with a demonstration of a coastal scene in watercolour, he will then help students create their own paintings with hints and tips on composition, colour mixing and painting techniques. There will be plenty of one-to-one tuition and students can work at their own pace. Robert always has plenty of reference photographs or students can bring their own. He is quite happy for students to use a different medium other than watercolour. 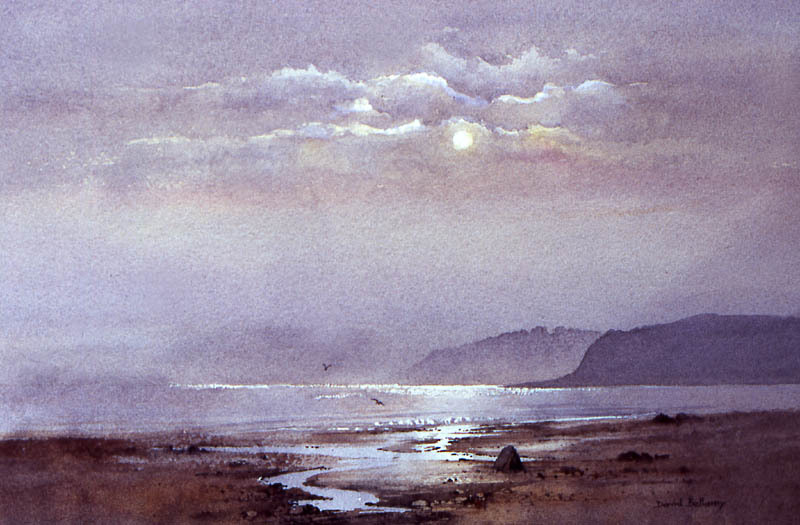 Skies and water are a popular choice for workshops and David Bellamy is an expert in creating atmospheric seascapes in watercolour. He will begin with a demonstration of a complete painting while discussing composition, colour mixing and special techniques. David will then help students create their own picture with plenty of one-to-one tuition. Students are advised to bring their own photographs and/or sketches to work from. David's workshops are very popular and early booking is advised. A deposit of £20 is required for each workshop when booking with the balance due at least 6 weeks prior to the date of the workshop. Please note that reminders are not given and you may forfeit your place on the workshop if the balance is not received by the correct time. Lunch and all refreshments are included, please advise us of any particular dietary requirements when booking. The full cost of a demonstration is required when booking. The images used in this programme represent the artist’s style of work and may not be the same painting used in the workshop or demonstration. Payments can be made by cash, cheque (made payable to The Sandpiper Studio), debit card or bank transfer. Payments will only be refunded if The Sandpiper Studio has to cancel a workshop or demonstration. We recommend that students take out their own cancellation insurance and personal accident cover. We cannot accept any responsibility for illness, damage to personal possessions or losses other than caused by our proven negligence. You are responsible and liable for any breakages or damages to the studio or its contents.